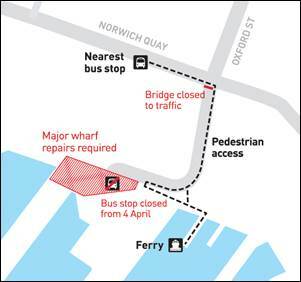 From 4 April the Oxford Street overbridge and the bus stop at the wharf will be temporarily closed until early 2017 while wharf repairs are undertaken. The Oxford Street overbridge will close to all traffic (except pedestrians) on Monday 4 April and will reopen in early 2017. 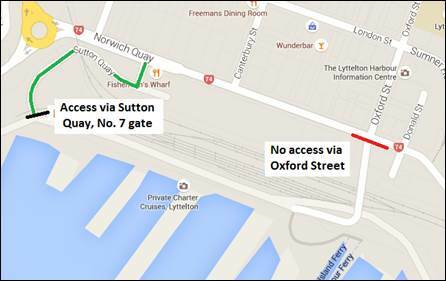 Traffic wishing to access the Inner Harbour at Lyttelton Port must use the Sutton Quay overbridge, No. 7 Gate. The bus stop on the wharf will also be closed and bus passengers are advised that bus services (numbers 28 and 535) will continue from the nearest bus stop on Norwich Quay. Stairs and a ramp will provide safe pedestrian access to the ferry terminal. Necessary wharf repairs and an upgrade on Jetties 2 and 3 require the temporary closure of Oxford Street overbridge and access to the in-shore end of the jetties will be restricted to ensure safety. Upgrading the wharf is important to provide the quality of port services our region needs. We appreciate your patience during the repair process.